A magnetosphere is the area of space near an astronomical object in which charged particles are controlled by that object's magnetic field. Near the surface of the object, the magnetic field lines resemble those of a magnetic dipole. Farther away from the surface, the field lines are significantly distorted by electric currents flowing in the plasma (e.g. in ionosphere or solar wind). When speaking about Earth, magnetosphere is typically used to refer to the outer layer of the ionosphere, although some sources consider the ionosphere and magnetosphere to be separate. Study of Earth's magnetosphere began in 1600, when William Gilbert discovered that the magnetic field on the surface of Earth resembled that on a terrella, a small, magnetized sphere. In the 1940s, Walter M. Elsasser proposed the model of dynamo theory, which attributes Earth's magnetic field to the motion of Earth's iron outer core. Through the use of magnetometers, scientists were able to study the variations in Earth's magnetic field as functions of both time and latitude and longitude. Beginning in the late 1940s, rockets were used to study cosmic rays. In 1958, Explorer 1, the first of the Explorer series of space missions, was launched to study the intensity of cosmic rays above the atmosphere and measure the fluctuations in this activity. This mission observed the existence of the Van Allen radiation belt (located in the inner region of Earth's magnetosphere), with the Explorer 3 mission later that year definitively proving its existence. Also in 1958, Eugene Parker proposed the idea of the solar wind. The term 'magnetosphere' was proposed by Thomas Gold in 1959. The Explorer 12 mission (1961) led to the observation by Cahill and Amazeen in 1963 of a sudden decrease in the strength of the magnetic field near the noon meridian, later named the magnetopause. In 1983, the International Cometary Explorer observed the magnetotail, or the distant magnetic field. 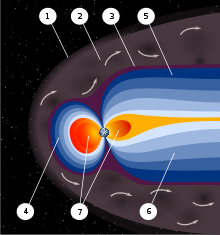 An artist's rendering of the structure of a magnetosphere: 1) Bow shock. 2) Magnetosheath. 3) Magnetopause. 4) Magnetosphere. 5) Northern tail lobe. 6) Southern tail lobe. 7) Plasmasphere.